thunderstrokes: Are you Serious? Real Genius and me. Sometimes, a movie just happens to come along at the right time in a person’s life. It may not be a great movie per se, one that is received with critical acclaim or crowned by popular sovereignty. It just happens to be the right movie for you, seen at the right time in your life for its message to hit you where you live, and change you in some perhaps small, yet substantial way. Films like this are somehow able to tell you things about yourself that your family and friends don’t see, or can’t see, or don’t want to say, or can’t say. These films help you recognize or realize something that you yourself may have been blind to, or unwilling to acknowledge before. I think that ability art has to communicate with our secret selves is one of its great functions, and the beauty of it is that it doesn’t have to be great art to have a great impact on the right person. For a movie, maybe it’s just one in every showing, or every other showing, or every ten showings. But for the person who is impacted, what difference does that make? We tend to embrace the movies that help us see things in a different way, help us change and grow. We invite these special films in amongst the collected assortment of relics that constitute our most private selves, and that’s where they tend to abide. They become our friends. We still laugh at all their jokes, long after they have lost their spontaneity and their ability to surprise. Their well-worn gags still delight us, not in spite of, but because of their familiarity. We overlook their flaws, and overemphasize their strengths, at least in contrast to the opinions of others. Just as with true friends, we cannot be purely objective when it comes to them. We have too much history together, and there is too much emotional attachment. It doesn’t matter that critics trashed it (none of them to your face, mind you), or that it didn’t get a great meta-score on RottenTomatoes.com, or that your other friends look at you like you’re completely nuts when you tell them you love this film. None of that matters. Just as with a true friend, you don’t expect the rest of the world to see what you see, as much as you might wish they did. The fact is you are bonded, friends for life, blood brothers. 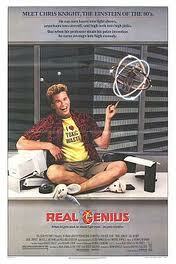 Real Genius is that kind of film for me. For a long time growing up, I didn’t take life seriously at all. I didn’t work hard. I saw the essential folly, or thought I did, of any one individual who tried to do anything more than laugh at the fundamental absurdity of life. I was a natural existentialist, long before Camus and Sartre meant anything to me beyond being simply funny-sounding words. This wasn’t just my favorite nursery rhyme as a kid, it was a philosophy. It was a way of looking at the world that I intuitively got at a very early age. Then, sometime around sophomore year in high school, something happened. I got...Serious. I loaded up on Ambition the way runners eat pasta before a race. I studied hard, joined clubs (prior to which I had been a strict non-joiner). I set my sights on going to Brown University, or if not Brown, possibly Princeton or Dartmouth. My guidance counselor thought Georgetown or Notre Dame was a more realistic goal, probably because the school I went to, Brophy College Preparatory, was a Jesuit school, and those were Catholic universities. I worked a part-time job, because I wanted to have money, and worked summers at the school to help offset the tuition. I became a staunch Republican, almost overnight. If you want to know what I was like sophomore and junior years of high school, look no further than Alex P. Keaton. I was a pitch-perfect copy. For those two years, I was a completely driven person. I was focused. I was competitive. I was on my way to Big Things. Big Things, I tell you, Big Things! And I was making myself sick. At first intermittently, but eventually it became a regularity, a Sunday evening ritual. Sometimes it would catch me early, but many times it would wake me up around eleven or so with quickly accelerating spasms of pain in lower depths of my gut. Within minutes of that initial warning, I would be sprawled on the floor of the bathroom (I was lucky; my room at that time had its own bathroom, so I able to keep this all very private), seized by such severe stomach pain that I thought I was going to die, or pass out; or pass out, and then die. Only the sweet coolness of the floor seemed to keep me tethered to consciousness and life. I would lie there, for thirty, forty, fifty minutes, while the pain came in wracking waves, sweating till the floor was slick, and I could feel it puddling around my face. Then came the Irresistible Urge, and I would have to drag myself up onto the toilet, and damn fast, before it was too late. Once my bowels were utterly eviscerated, I would collapse down onto the cool floor again, and the pain would rapidly dissolve, and my body temperature would drop fast, falling in a matter of a few minutes until I would start shivering, and that cold was the best feeling I had ever known, because it meant that my weekly tormentor had gone. When I was ready to stand again, I would rise, clean up whatever mess was left, and go back to bed. At first I blamed this on an allergy to eggs, since Mom made eggs almost every Sunday, and almost never at any other time. Later, my view of it grew more sophisticated, and came to believe that I was being humbled by God, to make sure my ambitions and greatness didn’t come at the expense of knowing who was ultimately in charge. Either way, I thought the problem was with me, and since I always survived these bouts without any apparent lasting effects, I never thought there was much of a point in bringing up the episodes and phantom symptoms to my parents, or anyone else for that matter. Oh yes, I was all about the Serious. This was the state of thing in the summer of ‘85, when Real Genius happened into theaters. I saw the movie primarily because it had Val Kilmer in it. 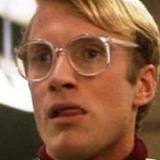 He had been in the movie Top Secret! the year before, and he was great fun to watch in the role of superspy Nick Rivers. Plus, at that point, when it came to movies, there wasn’t much I wouldn’t see. I had the money, and the time, and friends who would go with me. We had refined theater-hopping into an art form; we could pay five bucks and spend the entire day watching movies. In that sense, it was kind of a dream life, one that lasted for such a brief time during those precious high school years. In Real Genius, the story involves a preternaturally Serious kid named Mitch (Gabe Jarret), who is so smart he doesn’t fit in with kids his own age, and soon discovers that he has been accepted to Pacific Tech at the age of 15, one of the youngest ever to be admitted. He arrives at the university; small, timid, and already overwhelmed. He finds out that his roommate is a legendary brainiac by the name of Chris Knight (Val Kilmer), who appears to be anything but Serious about school as he introduces Mitch to college life. Despite his initial misgivings, Mitch and Knight become friends, as Knight tries to teach Mitch how to relax and have fun. Also helpful in the process is the presence of Kent (Robert Prescott), a rigid, bitter, mean-spirited fool, albeit a smart fool. Kent serves both as nemesis for Knight, and as a kind of poster child for the kind of Serious person Mitch might one day become if he were to continue down his Seriously twisted path. I won’t tell you how the plot evolves from there. It’s not necessary, for one thing, and for another, I’m hopeful that you will see it for yourself. It’s not a film that’s easy to find, but it’s entertaining and funny, and well-written, and it’s a great example of Val Kilmer’s talent for comedy, if nothing else. But I’m willing to bet you’ll find more in it to like than that. Suffice it to say that, by the end, Mitch has learned that being too Serious is just as bad as not being Serious at all, and maybe worse. It doesn’t take much imagination to see how easy it was for me to identify with Mitch. And the movie forced me to confront the fact that the things I spent most of my time doing: the manic emphasis on studying, and SAT scores, and having enough involvement in school to qualify as one of the academically-excelling, ‘well-rounded’ types they kept telling us Ivy League schools preferred, none of that was bringing me any real joy. I wasn’t having any fun. It was all pressure, and tension, and Sunday nights spent lying prone on the bathroom floor. See, I think we all tend to kind of idealize and objectify happiness, to treat it as some perfect good that can somehow be attained. And for many of us, we delude ourselves into thinking that we should accept today’s pain and suffering because it will, at some indeterminate future time, result in that euphoric, culminating state of Happiness we are striving so hard to reach. But it’s ludicrous, of course, to expect that doing something which brings you no happiness now will somehow magically bring you Happiness, if you continue to do it long enough. That, as we know, is one definition of insanity. Ah, yes, but how do we know if we’re happy? I love this question because it’s so indicative of the human condition. Fortunately, Real Genius offers an answer to that question too, and the answer is simple. Are you having fun? If you’re having fun, there’s a good chance you’re happy. It sounds so simplistic, reducing happiness to whether a person is having fun or not. But as I get older, I find myself seeing a kind of wisdom in the idea. For one thing, fun is a deeper, and more complex phenomenon than the clichéd version we immediately tend to think of. Fun is more than birthday parties and amusement parks. And fun can mean different things to different people. For instance, I am sitting here writing this piece, and I am having fun doing it. I’m not wearing a colorful hat. I’m not throwing confetti and spraying Silly String everywhere, but for me writing is a deeply satisfying form of fun. I’ll be the first to admit it’s not everyone’s cup of tea, but it’s mine, and I’m happy to have it. That’s not to say that to be happy we must constantly be having fun. And no one is suggesting that this permits us to avoid all work, tough decisions, and any difficult situation we may encounter in life. We all know there are things we have to do, or endure, in which fun plays no part. Nor does Happiness guarantee freedom from all suffering. What I’m talking about is when it’s time to choose the direction that your life is going to take, do you take the path that allows you to have fun and therefore experience happiness along the way, or do you take the path that removes them from your grasp, and relegates them to some hazy, desert island with unknown coordinates in an endless, open sea? By the time I saw Real Genius, I had been sufficiently humbled by the consequences of trying to construct the future I thought I wanted. The movie showed me that pushing yourself until you break isn’t worth it. It’s not a good thing, and it means that something is severely out of whack. It told me that it was okay to lighten up, and not take everything so Seriously, to enjoy myself a little more, and to try and have a little more fun with the time I have. I started sneaking my Walkman with me into school, so I could listen to the music I loved at lunchtime or during my free period. I started wearing my Pink Floyd Dark Side of the Moon hat to school, even wearing it inside the buildings once or twice, which was verboten and which was, for me, the equivalent of hoisting an anarchy flag and declaring open war on all conformity. I stopped obsessing over grades and test scores and college applications and essays. I didn’t take Honors English my senior year, or Calculus, or Harvard Project Physics. And in the classes I did take, my grades fell back from the academic pinnacle of the previous year, even though they were still pretty respectable overall. At home, I started wearing funny t-shirts (at least I thought they were funny), and let my hair grow out, and abandoned the immaculate, left-side part of Mr. Alex P. Keaton. My parents and teachers probably attributed all this to senioritis; I don’t honestly remember. I knew there was more to it than just blowing off the work in anticipation of getting out of high school, though that was real too. I was responding to the mentor I found in the character of Chris Knight, and the new, more moderate philosophy offered by the film as a whole. Even my Sunday night tradition started to change, becoming less and less frequent; first skipping a week, then happening once a month or so, then just a few times a year, until it finally became once in a blue moon, which is the way it has stayed ever since. Sometimes the lessons learned in life are lost, and must be relearned and rediscovered. When it comes to lightening up, and enjoying life while it lasts, I’ve had my struggles, and I’ve had to learn the hard way more than once. 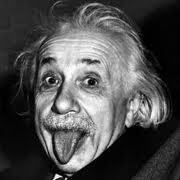 But Real Genius has always been there to remind me, to coax me and encourage me, whenever I was willing to stop the self-induced madness and listen for a change. And I always wonder how much longer it would have taken me to learn that first, crucial lesson way back when, all those years ago, if Real Genius had never happened to me at all. After all that, how can I not feel indebted to this film? How can I not feel anything but gratitude and joy at its existence?